NES Titenic (Asia) in 03:54.28 by TASeditor. 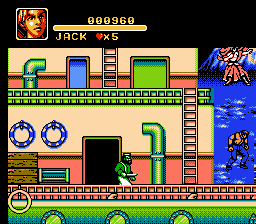 Titenic (sic) is a Famicom beat 'em up based on the 1997 film Titanic. The game originally surfaced on a ABAB 3-in-1 multicart and was later found on a 15-in-1, separated into two games. Watch as Jack and Rose jump through the Titanic, beating up everyone in order to ensure the ship sinks in a brisk 4 minutes.